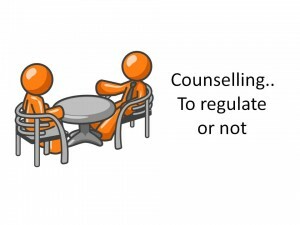 Should counselling and Psychotherapy be regulated? This question started for me when I was training to be a counsellor back in 2003. It was often debated amongst my peers as there were some who against regulation. I have always been in favour of regulation and was disappointed when it was decided by Health Professional Regulation not to regulate counselling. Instead a new Accredited Register (AR) scheme for health care professionals was launched by the Professional Standards Authority (PSA) at the end of 2012. Lately, a colleague Amanda Williamson who herself suffered abuse whilst being counselled (and successfully got the said person struck off the BACP register) and Philip Dore’s website Unsafe Spaces have re-opened the debate on counselling regulation. You can read Amanda’s stance for regulation here. I believe that regulation will help stop clients being abused and will ensure that client’s autonomy is protected. You may be surprised to hear that clients are physically and emotionally abused by counsellors but you just need to read Philip Dore’s website or the complaints against counsellors under the professional conduct section in Therapy Today to know that abuse is still going on since the introduction of the AR. More importantly joining the Accredited Register does not necessarily hold counsellors accountable. As both Amanda and Philip Dore have highlighted, from the recent Palace Gate Counselling complaint, a counsellor can still practice even though they have been struck off the British Association of Counselling and Psychotherapy (BACP) register. Even more worrying, there is nothing stopping someone completing a basic counselling course and calling themselves a counsellor or psychotherapist (as the names are not protected) that it is about educating the public what credentials they should look for in a counsellor. Yes, I agree with that. However, that could be a stronger argument for regulation. If it is law then you can guarantee that people will be more aware of what is needed for a counsellor to practice and protect their client. As I’ve mentioned before in my post about being a BACP counsellor, one of the arguments against regulation is that it may stop less academic counsellors from practising or even put some counselling models at risk. I do not believe this is the case, as regulation of counselling is more about ensuring a counsellor works ethically and within their own competencies. Those who do not will be held to account and if they are ‘struck off’ they will not be able to practice. At the moment counsellors who are stuck off one register can still practice under another register or without any membership. This illustrates that the voluntary accredited register does not fully protect our clients. Over the last 10 years training as a counsellor has become popular and there are many courses available. The requirements of course attendance, the length of time studying and quality of training differs for each course. I recently saw one counselling course being run by a counsellor who has been in practice for a year. Is this acceptable to ensuring ethical practice? I would envisage that regulation would help ensure that all courses have the same standards. I understand some concerns about joining a register. I am sure that protecting the name will not stop people calling themselves something else and still practising. In the last few years, I have witnessed the stress of GPs who live under the cloud of complaints and their professional integrity unreasonably questioned. As more and more patients suing, it has resulted GPs insurance costs being at least 10 times more a month than mine . Do we as a counselling profession want to be under this pressure and scrutiny? However, one thing that is certain that us counsellors work with vulnerable people. These clients need to trust us and know we will protect them and work ethically. Therefore I feel it is time to put statutory regulation of counselling and psychotherapy back onto the agenda. In the meantime counsellors and psychotherapists need to continue educating the public on what the general public need to look for when seeking out counselling or psychotherapy. This entry was posted in BACP, counselling, Personal perspective and tagged BACP, counselling, psychotherapy, regulation on August 22, 2015 by Hazel Hill.